A protein complex that moves molecules called lipopolysaccharides between the two cell-wall membranes of certain bacteria is a target for antibiotics. Structures now reveal how this complex delivers its load irreversibly. Russell E. Bishop is in the Department of Biochemistry and Biomedical Sciences, and the Michael G. DeGroote Institute for Infectious Disease Research, McMaster University, Hamilton, Ontario L8S 4K1, Canada. Many bacteria that cause infections are surrounded by two distinct membranes, which form part of their protective cell wall. The surface of the outer membrane includes a tightly packed layer of glycolipid molecules known as lipopolysaccharides (LPSs), which provide a barrier against harmful detergents and antibiotics. The LPSs are synthesized in the inner membrane, before being transported and assembled in the outer membrane1 — the molecules are extracted from the external layer of the inner membrane and shuttled across a bridge to the outer membrane, before emerging on the cell surface. Two papers2,3 published in Nature now provide long-awaited details of the molecular processes that drive LPS transport. The structures of six of the seven components of the LPS transport apparatus (known as LptA–G) have been fully characterized1,4. 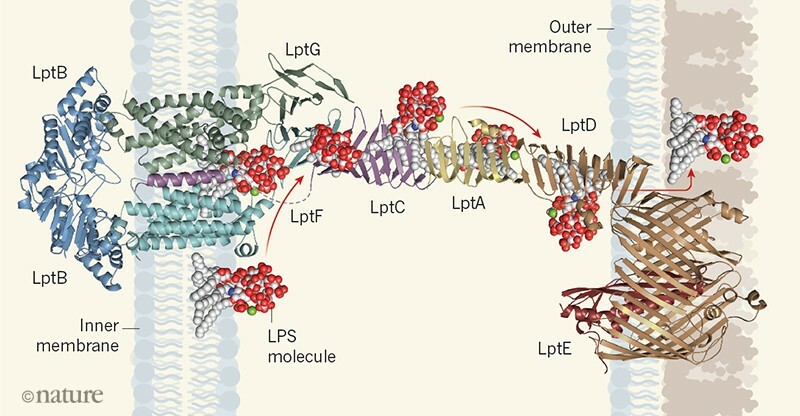 They reveal that a portal for LPS molecules forms from the LptD and LptE subunits in the outer membrane, and is connected to a pump in the inner membrane (formed from LptF, LptG and two LptB subunits) by a bridge, which includes one or more LptA subunits (Fig. 1). The pump is driven by the binding and hydrolysis of cytoplasmic ATP, the cell’s energy-carrying molecule, but how it binds to LPSs from the inner membrane and pumps them only in the outward direction was unknown. 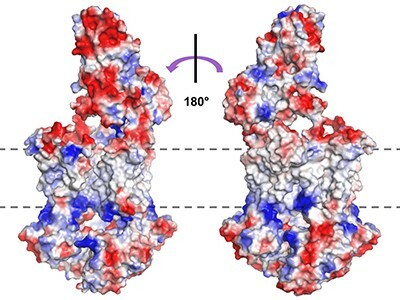 A full-length structure of the inner-membrane protein LptC was needed to complete the puzzle and to explain how the pump is connected to the bridge. Figure 1 | Structural model of the lipopolysaccharide (LPS) transport apparatus. Many bacteria have two membranes in their cell walls. The upper surface of the outer membrane consists of LPS molecules, which are synthesized in the inner membrane and shuttled to the outer membrane by the LPS transport apparatus — a complex formed from seven types of protein subunit (LptA–G). Li et al.2 and Owens et al.3 report structures of the LptB2FGC complex. These reveal that the transmembrane helix of LptC is wedged between LptF and LptG to create a cavity that allows the LPS to enter a chamber in the complex; the loop that connects LptC to its transmembrane helix was not resolved in the structure shown, and is drawn here as a broken line. The LPS then passes on to LptF, which (together with LptC and LptA) forms a bridge to the LptDE complex in the outer membrane. LPS molecules in the external leaflet of the outer membrane are shown schematically; phospholipids line the interior leaflet. The inner membrane is an ordinary phospholipid bilayer. The LptB2FGC complex3 depicted is from Enterobacter cloacae; the LptA is from Escherichia coli12; and the LptDE complex is from Shigella flexneri13. Li et al.2 and Owens et al.3 have resolved this issue. Li et al. report structures of the LptB2FGC complex from the bacterium Escherichia coli, produced using cryo-electron microscopy (cryo-EM). These structures show how the complex binds to LPS molecules, and the conformational rearrangements of the complex that occur when LPSs are captured and extruded onto the bridge. 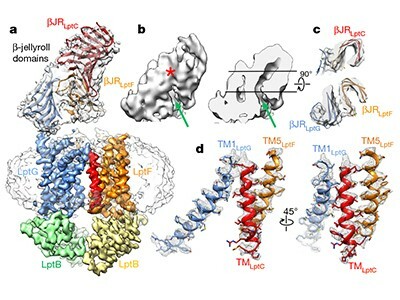 Owens et al.present X-ray crystal structures of LptB2FGC from two other bacteria (Vibrio cholerae and Enterobacter cloacae), which show how LPSs are transported irreversibly towards the outer membrane. In structural-biology studies, membrane proteins are often extracted from the membrane’s lipid bilayer into water-soluble aggregates of detergents known as micelles. This enables crystals of membrane proteins to be grown. But because the architecture of micelles is different from that of natural membranes, the process can perturb the natural structure of the protein. Li et al. opted instead to reconstitute LptB2FGC in miniature blocks of lipid bilayers known as nanodiscs, which are stabilized by a scaffolding protein. The nanodisc-embedded LptB2FGC complex proved to be ideal for structural analysis using cryo-EM. Previously reported X-ray studies5,6 of LptB2FG crystallized in detergent micelles revealed an interior chamber that looked as if it might be able to accommodate an LPS molecule. Speculation that this chamber was an LPS-binding pocket could not be confirmed, however, because it wasn’t possible to obtain structures in which an LPS was bound in the chamber — probably because LPSs are displaced from the chamber by the detergent molecules. Li and colleagues’ efforts have paid dividends, because their structure contains a complete LPS molecule buried in the interior chamber, and thereby clearly shows that the chamber’s function is to bind to an LPS. Li et al. used cryo-EM to study LptB2FGC in the absence of ATP and in the presence of a trapped nucleotide known as ADP–vanadate, which is thought to mimic the structure of ATP during the transition state of the ATP hydrolysis reaction. (Transition states are configurations of molecules that form during reactions, and are characterized by the presence of partly broken and partly formed bonds.) Comparison of the ATP-free and ADP–vanadate-trapped structures suggests that LPS passes from the external leaflet of the inner membrane through an open cavity at the chamber’s side. Structural rearrangements transmitted from LptB to the transmembrane domains of LptF and LptG then lock the LPS in place, before squeezing it out along the bridge. Further work is needed, however, to determine exactly how the ATP binding and hydrolysis steps are coupled to LPS transport. Once expelled from the membrane, the LPS molecule rotates by about 90° to become localized within an LPS-binding motif (known as a β-jellyroll domain) in LptF. Both LptF and LptG contain β-jellyroll domains, but only LptF interconnects with the β-jellyroll domains of LptC, LptA and LptD, and thereby forms the bridge to the outer membrane. The previous studies5,6 of the LptB2FG complex (that is, the complex that lacked LptC) revealed almost symmetrical structures that have two plausible routes for the lateral entry of LPS. A logical proposal4,6 was that LPS molecules entering the transporter alternate between the two routes. This model must now be discarded, because the new findings from Li et al. and Owens et al. show that LptC breaks the structural symmetry of the transporter, so that LPS enters by only one route. The symmetry-breaking occurs because the single transmembrane helix of LptC wedges itself between the first transmembrane helix of LptG and the fifth transmembrane helix of LptF. Moreover, the β-jellyroll domain of LptC extends to stack on top of that of LptF, thereby forming a continuous groove for trafficking LPS. The upshot is that only one pathway for LPS entry and transport is defined in the new structures. Owens et al. used a biochemical technique called photocrosslinking to confirm that LPS accesses the bridge through LptF, bypassing LptG. It remains to be seen whether LPS transporters in other bacteria5 access the bridge through LptG. Importantly, both studies indicate that ATP hydrolysis is more efficiently coupled to LPS transport in the LptB2FGC complex than in the complex that lacks LptC. Each cycle of ATP binding and hydrolysis is coupled to the expulsion of one LPS molecule from the inner chamber. The picture that emerges is of a single line of LPS molecules queuing up to pass individually across the bridge. But although this queuing model seems intuitively straightforward, in reality, Brownian motion should cause the LPS molecules to dance back and forth along the bridge. A mechanism that ensures that LPS transport proceeds only in the direction of the outer membrane is therefore required. Intriguingly, Owens et al. observed that the LptF β-jellyroll domain in the E. cloacae structure has an open gate for LPS at the entrance to the bridge, but that in the V. cholerae structure the gate is closed. By modifying the protein structure, the authors were able to lock the gate in the closed state, effectively blocking LPS transport without affecting ATP hydrolysis. The authors infer that the gate opens to allow LPS to slide past, but then spontaneously closes behind the molecule to block any backward flow, much like the pawl mechanism of a ratchet. A pioneering study7 in 1972 was the first to indicate that LPS transport was irreversible. Forty-seven years later, those findings can now finally be understood in molecular terms. Efforts to target LPS transport for the development of antibiotics are looking promising8–11. The two new studies provide insights that might aid these efforts. Okuda, S., Sherman, D. J., Silhavy, T. J., Ruiz, N. & Kahne, D. Nature Rev. Microbiol. 14, 337–345 (2016). Li, Y., Orlando, B. J. & Liao, M. Nature https://doi.org/10.1038/s41586-019-1025-6 (2019). Owens, T. W. et al. Nature https://doi.org/10.1038/s41586-019-1039-0 (2019). Dong, H., Tang, X., Zhang, Z. & Dong, C. Biochim. Biophys. Acta 1862, 1461–1467 (2017). Luo, Q. et al. Nature Struct. Mol. Biol. 24, 469–476 (2017). Dong, H., Zhang, Z., Tang, X., Paterson, N. G. & Dong, C. Nature Commun. 8, 222 (2017). Osborn, M. J., Gander, J. E. & Parisi, E. J. Biol. Chem. 247, 3973–3986 (1972). Mandler, M. D. et al. J. Am. Chem. Soc. 140, 6749–6753 (2018). Zhang, G. et al. Proc. Natl Acad. Sci. USA 115, 6834–6839 (2018). Ho, H. et al. Nature 557, 196–201 (2018). Robinson, J. A. Front. Chem. 7, 45 (2019). Suits, M. D., Sperandeo, P., Dehò, G., Polissi, A. & Jia, Z. J. Mol. Biol. 380, 476–488 (2008). Qiao, S., Luo, Q., Zhao, Y., Zhang, X. C. & Huang, Y. Nature 511, 108–111 (2014).